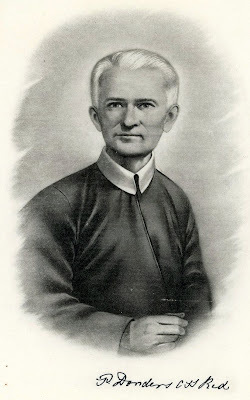 Today is the feast of Blessed Peter Donders, a priest who spent his life ministering to lepers in South America. Peter Donders was born in Tilburg, Holland, on 27th October 1809 of Arnold Denis Donders and Petronella van den Brekel. Because the family was poor, the two sons could be given little schooling but had to work for the support of the home. From an early age, however, Peter had formed the desire of becoming a priest. Eventually, with the assistance of the clergy of his parish he was able at the age of twenty two to commence study at the Minor Seminary. In due time he was ordained priest on 5th June 1841. While still engaged in his theological studies he had been guided by his superiors in the seminary towards the missions of the Dutch colony of Surinam. He arrived in Paramaribo, the principal city of the colony, on 16th September 1842 and applied himself at once to the pastoral works that were to occupy him until his death. His first duties included regular visits to the plantations along the rivers of the colony, where he preached and ministered the Sacraments mainly to slaves. His letters express his indignation at the harsh treatment of the African peoples forced to work on the plantations. In 1856 he was sent to the leper station of Batavia; and this was to be, with very few interruptions, the scene of his labours for the rest of his life. In his charity he not only provided the benefits of religion to the patients, but even tended them personally until he was able to persuade the authorities to provide adequate nursing services. In many ways he was able to improve the conditions of the lepers through his energy in bringing their needs to the attention of the colonial authorities. When the Redemptorists arrived in 1866 to take charge of the mission of Surinam, Father Donders and one of his fellow priests applied for admission into the Congregation. The two candidates made their novitiate under the Vicar Apostolic, Bishop Johan Baptist Winkels, and they took their vows on 24th June 1867. Father Donders returned at once to Batavia. Because of the assistance he now had with the lepers, he was able to devote time to a work he had long wished to undertake. As a Redemptorist he now turned his attention to the Indian peoples of Surinam. He continued with this work, previously neglected through lack of manpower, almost until his death. He began to learn the native languages and to instruct the Indians in the Christian faith, until failing strength compelled him to leave to others what he had begun. Blessed Peter, Pray for us.